Rockstar announced today that it's going to give every player who has played or logs into Grand Theft Auto V Online this month $500,000 (about £313K, AU$527K) in virtual currency. The game developer called it a "stimulus package" for players who this month dealt with a troubled launch that made it difficult to log into the new GTA's much-hyped online mode. GTA V launched in September, but initially only the single player story mode was available; the online portion, which lets up to 16 players roam free in city-spanning gameplay sessions, launched at the start of October. But Rockstar's servers were quickly overloaded and many players found it impossible to get online or ran into bugs that corrupted their saved files and had other negative effects. Rockstar no doubt hopes the GTA$500K stimulus package will make up for that. "Given some of the recent technical issues during these first days of GTA Online, and now that things are starting to look much smoother (touch wood! ), we are planning to provide a special stimulus package for all who have played or will play Grand Theft Auto Online this month," the developer wrote on its website and in an email sent to players this morning. 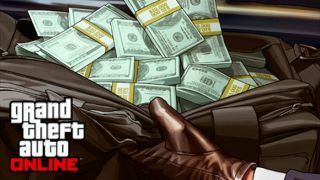 In Grand Theft Auto V Online players can engage in jobs and missions with or against one another in the hopes of earning in-game cash to buy things like cars and apartments. It's like real life, if your job was to race planes and blow things up. The stimulus package money will be deposited in users' in-game bank accounts, accessible through ATMs or their characters' smartphones, in two installments of GTA$250,000. The first will arrive "as early as next week," according to Rockstar. First the developer will confirm that issues causing players to lose progress have been fully fixed, though. After that, the second deposit will arrive at the end of October. To receive the cash, players need only log into Grand Theft Auto V Online any time during October and download an upcoming title update. That GTA$500,000 should be enough for most GTA V Online players to start living like ballers, creating a class of well-equipped high rollers with a competitive edge over new players who come in after the stimulus package goes out. In other words, GTA V Online is about to get even more realistic. The PC version of Grand Theft Auto V could come out in early 2014, according to the latest rumor.